"Best Wishes!" 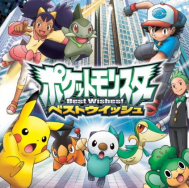 (ベストウイッシュ！) is the first opening theme to Pocket Monsters Best Wishes. Mou dou surya ii no sa? Demo modoru to ka kangaerarenai! Nakama ga iru kara daijoubu!" A story that's only told here. My knees are shaking and I'm sweating all over. But there's no way I can think about turning back! For a familiar voice, a voice from the future. And have friends with me so I'm alright!"